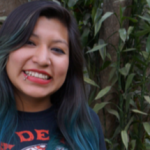 Heidy was selected as a GOJoven Guatemala Fellow when she was 22 years old. She is a young woman with knowledge in Sexual and Reproductive Health, and has experience as a facilitator, trainer, and SSR educator, and organizational leader. She has also been artist from young, as well as a community leader and entrepreneur of various projects. Her strengths as a facilitator in holding workshops are in learning from her participants and sharing.